Posted on September 9th, in Events. Our recent End-of-Summer Soiree at Glen Oak Country Club in Glen Ellyn was a beautiful evening featuring distinguished pro-life legislators from both political parties on the state and national levels. The terrace overlooking the golf course provided a lovely setting for socializing and cocktails. Congressman Dan Lipinski shared a heartfelt testimony about being the nation’s only pro-life Democrat of the “Stupak 12” who held firm in opposing Obamacare because of its pro-abortion provisions. Congressman Randy Hultgren gave a tour-de-force review of pro-life legislation that he is involved with in Washington to protect human life, ranging from opposition to the expensive contraceptive mandate in insurance plans to efforts to remove taxpayer funding from the nation’s largest abortion provider. Attendees were also treated to an advanced look at the 2012 races that ICE-PAC will be getting involved with. It was a memorable evening. Thank you for your support of ICE-PAC as we work to give Illinois back to the people! 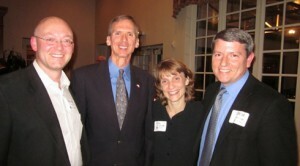 Congressman Dan Lipinski (second from left) and his wife Judi with ICE-PAC Chair Kevin Costello and Board member Brian Hengesbaugh. 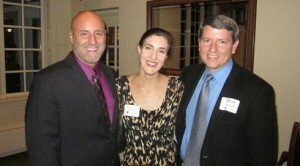 ICE-PAC Executive Director John Kurey (left) with Board members Mary-Louise and Brian Hengesbaugh.